Through a series of case studies, this third volume in the Earth series deals with the technological constraints and innovations that enabled societies to survive and thrive across a range of environmental conditions. 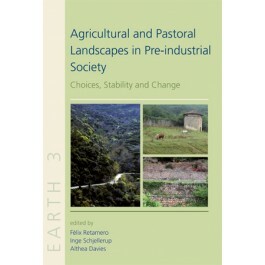 The contributions are structured into three sections to draw out particular commonalities and contrasts in the choices made by pre-industrial communities in the construction of varied landscapes and cultural heritage: Landnam, from the Old Norse for‘taking of land’, deals with colonisation, including the drivers and processes through which colonisers developed an understanding of the productive potential and limitations of their new lands. Fields and field systems: Field-walls are a distinctive and apparently timeless characteristic of many pre-industrial farming landscapes but they present many the challenges to their study, such as the effects of ploughing, abandonment and land-use change and of urban development in fertile lowland zones which may eradicate, reduce or conceal past systems of land-use and division. The importance of indirect and proxy evidence is illustrated and the value of interdisciplinary and modelling approaches emphasised. Agro-pastoralism: focuses on the complex‘time-space adaptations’ devised for managing cultivation and livestock production, particularly the need to prevent stock incursions into arable fields during the growing season whilst making effective use of seasonal grazing resources. The contributions focus on mountainous areas, where temporary migrations, in the form of transhumance, provided access to a diversity of resources based around seasonal constraints on their availability and productivity. "This is a is a fascinating study and, to top it all, the volume is beautifully illustrated. It fully deserves to become better known."